Wethersfield, Conn. (September 3, 2013) –When Wethersfield resident Katherine Harrison married “up” in the mid-1600s, people talked. When the widowed former servant had issues with her neighbors, they accused her of witchcraft. Harrison narrowly escaped the noose, but was banished and financially ruined. Details on Harrison’s and other Wethersfield witchcraft cases, 19th-century funeral practices, and some of the most notable “residents” of the Wethersfield Ancient Burying Ground will be presented during the 2013 Webb-Deane-Stevens Museum Witches and Tombstones Tours in Wethersfield, Connecticut. The event has been expanded to include tours from 10 a.m. to 4 p.m. on October 19 and 20 and October 26 and 27. Admission for the 90-minute tours is $13 per person. Space is limited and reservations are strongly advised. The first stop on the tour is the Buttolph-Williams House—home to the characters portrayed in the Newbery award-winning book, “The Witch of Blackbird Pond,” by Elizabeth George Spear— where costumed guides will share particulars on the Wethersfield witchcraft accusations. The confession of witchcraft by Wethersfield resident Mary Johnson in 1648 was the first of 43 Connecticut cases, with 16 ending in execution. 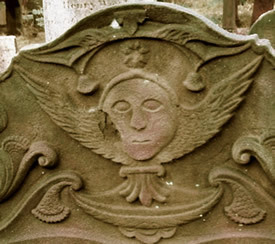 Next on the tour is the Wethersfield Ancient Burying Ground, where, among other gruesome details, visitors will hear details of Connecticut’s first mass murder and learn how gravestones warned the living of their own impending peril. Back at the Isaac Stevens House,visitors will step back in time and view a room fully prepared for a wake, replete with coffin, draped windows and mirrors. Guides will explain 19th-century mourning practices, how illnesses were treated in the Isaac Stevens House, and discuss how the living dealt with fears of being buried alive. For reservations, call 860-529-0612, ext. 12. For more information on the Webb-Deane-Stevens Museum, please go to http://webb-deane-stevens.org. Located in the heart of Connecticut’s largest historic district, the Museum consists of three authentically restored 18th-century homes that bring Wethersfield’s rich history to life, from the American Revolution to the early 20th century. The museum includes the 1752 Joseph Webb House, which served as George Washington’s Revolutionary War headquarters in May 1781, when he met with French General le comte de Rochambeau; the 1770 Silas Deane House, built for a delegate to the Continental Congress and America’s first diplomat to France; and the 1788 Isaac Stevens House, which depicts life in the 18th and 19th centuries through original family objects and includes a fascinating children’s exhibit. Silas Deane Online - Received the 2007 Award of Merit from the American Association for State & Local History.